Twitter's inability to deal quickly and effectively with abusive online trolls has reached a breaking point, a problem exacerbated by the fact that its latest new feature lets anyone send you direct messages. Luckily today the social network introduced several new measures it can use to combat abusive users, including alterations to policy language and new enforcement tools detailed in a Twitter blog post. Twitter's violent threats policy now prohibits "threats of violence against others or promot[ing] violence against others" instead of only "direct, specific threats of violence against others," for one thing. 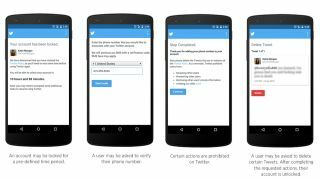 And Twitter's support team can now lock abusive users' accounts for set periods of time, in addition to their existing powers to require users to verify their phone numbers or delete specific tweets. Twitter is also introducing a feature designed to more accurately detect abusive tweets automatically. "This feature takes into account a wide range of signals and context that frequently correlates with abuse including the age of the account itself, and the similarity of a Tweet to other content that our safety team has in the past independently determined to be abusive," the blog post reads. "As our General Counsel Vijaya Gadde explained last week in an opinion piece for the Washington Post, we need to ensure that voices are not silenced because people are afraid to speak up," the post says. The people she's referring to are those bombarded with abuse from people who don't like who they are or their opinions. These attacks have affected all types of people on Twitter, and the company has so far been inexcusably slow and ineffective at combatting them. But it sounds like Twitter may finally be hearing the message, and things might change for the better. "While dedicating more resources toward better responding to abuse reports is necessary and even critical, an equally important priority for us is identifying and limiting the incentives that enable and even encourage some users to engage in abuse," the post continues. "We'll be monitoring how these changes discourage abuse and how they help ensure the overall health of a platform that encourages everyone's participation. "And as the ultimate goal is to ensure that Twitter is a safe place for the widest possible range of perspectives, we will continue to evaluate and update our approach in this critical arena."